The win in Ecuador’s presidential elections of leftist government candidate Lenin Moreno will likely have provided relief to WikiLeaks' founder Julian Assange, who had been threatened with eviction from the country’s embassy in London by the opposition candidate. The election in the South American country had aroused interest in part because the conservative opposition candidate, Guillermo Lasso, had said that if elected he would evict Assange within 30 days of assuming power, because it was costing the country too much to keep him at the embassy. 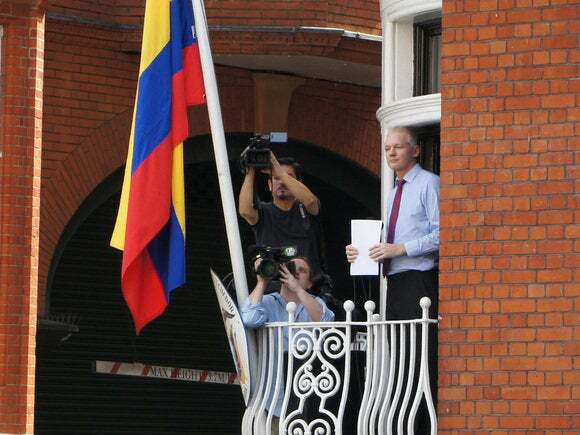 The embassy is being constantly monitored by U.K. police ever since Assange slipped into it in 2012 and was granted asylum by the Ecuador government. Police say they will arrest Assange if he comes out of the embassy to meet an extradition request from Sweden in connection with an investigation into a sexual assault. Assange supporters are concerned that he may be moved from Sweden to the U.S. to face charges in connection with several leaks of confidential U.S. government information. On Sunday, Assange tweeted his congratulations to Moreno and officials in Ecuador, including Rafael Correa, the current president of Ecuador. "I cordially invite Lasso to leave Ecuador within 30 days (with or without his tax haven millions)," wrote Assange in another message, referring to charges that Lasso had avoided taxes by stashing cash abroad. On Friday, WikiLeaks released files that allegedly show how the CIA was masking its malware attacks, the latest dump by the whistleblower site of confidential information from the agency. During the run-up to the U.S. presidential elections, WikiLeaks also leaked mails from the Democratic National Committee that showed that the Democratic Party’s national strategy and fund-raising committee had favored Hillary Clinton over her rival Senator Bernie Sanders for the party nomination. The website also published mails from the account of John Podesta, chairman of Clinton's campaign. The administration of former President Barack Obama and Clinton’s campaign have accused WikiLeaks of cooperating with Russian hackers with the aim of raising questions about the legitimacy of the presidential elections. The Lasso camp is demanding a recount of the votes cast in the presidential election, according to reports. Although he backs Assange's continuation at the embassy, Moreno said he would ask him to to "be very delicate when he addresses international politics, especially regarding countries with which we have good relations," according to Latin American news outlet teleSUR.